Over the last 10 years, businesses have increasingly chosen to outsource some or all of their IT operations to outside providers who specialize in this, commonly referred to as managed IT services providers, or MSPs. The quality and specific services offered by MSPs varies, but this type of arrangement generally results in lower overall technology costs, reduced risks, and happier employees. Like most business decisions, there are pros and cons. Small and medium-sized businesses benefit the most from contracting with a reputable third party for their technical support needs. One of the main reasons is that the cost of employing the right number of IT resources to effectively support a business with 20-250 employees is generally more than these sized businesses can, or are willing, to invest in IT. MSPs generally work on a contract basis, which means that they are financially motivated to keep their customers happy. Vendor results are typically watched more closely than those of employees. They don’t go on vacation, they’re never “off” or out sick, and you don’t have to worry about the HR aspects of managing them. Resources are rapidly scalable. If you experience a bunch of problems at once, an MSP will be able to quickly allocate many representatives to solve the problems simultaneously. This means multiple employees can get help from different IT technicians at the same time. And when things are working smoothly, nobody is being paid to sit and wait for the phone to ring. This reduces downtime and improves employee productivity. Your business is able to focus on what it does best while your MSP focuses on what it does best. Since their business is your IT, you benefit from their economies of scale, the technology partnerships they have, and innovative ideas from their industry experts. Proactive measures are implemented, ensuring things continue to work how they should. IT as a category contains many disciplines: security, cloud, storage, communications, networking, ERP, EMR, accounting software, etc. Most small businesses can’t afford to employ experts in each of these areas. Hiring someone who is a helpdesk specialist and expecting them to manage your network is like hiring a machinist and expecting them to also handle accounting. When you use an MSP, these experts are easily accessible because the cost of employing each one of them is distributed amongst each one of the MSP’s clients. Managed IT services providers are evolving and changing, and great advances have been made in recent years. With today’s technologies, outsourced IT providers can feel like a part of your organization, but for some, it’s just not the same. 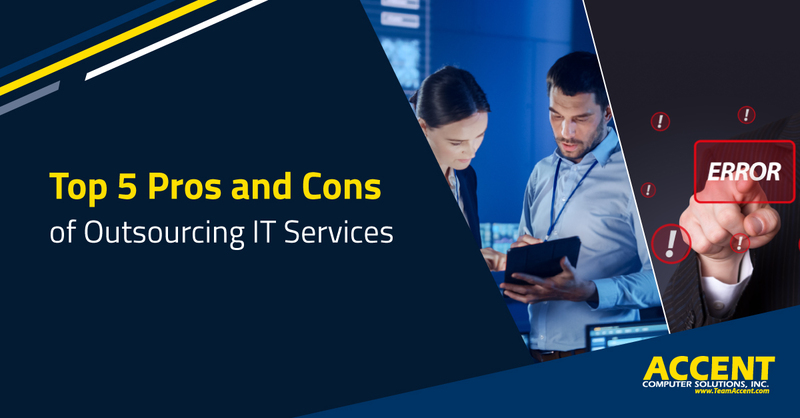 The right managed IT services arrangement mostly has pros, but some companies have experienced this short set of cons. Not having IT staff in the office all the times makes some business executives uncomfortable. Having a third-party manage your IT may mean shifting control. It could (but not always) mean letting go of in-house IT personnel. It changes “how we’ve always done things” and requires some organizational change. If the agreement is not structured in a way that benefits your company, you could end up spending more than you should. Deciding to rely on a third-party to manage some or all of your IT operations is a huge decision. Whether you choose to outsource the IT department or keep in internal, one of the main factors to your success is YOU. Without properly managing the IT staff or outsourced vendor with the right metrics and KPIs, you will not get the results you’re looking for from IT. The right IT vendor will help you along that path. Get the FREE Guide to IT Support Services for Southern California Businesses: Essential Information for Executives Who Want Better Business Results from IT.